Dosa, yes, we all love Dosa and different types of Dosa recipes from Rava Dosa to Sada Dosa. 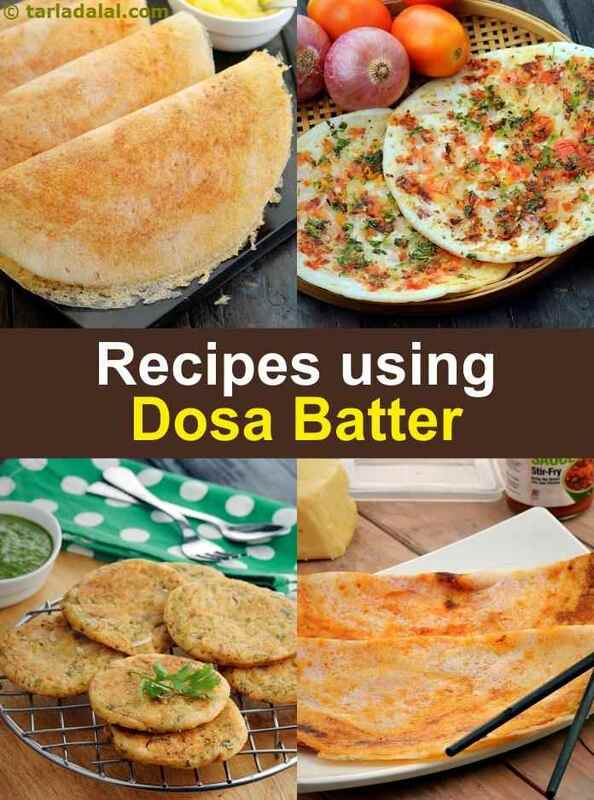 We are excited to share with you recipes using Dosa batter. For South Indians, breakfast is comprises mainly of dosas and idlis and they make enough batter which they can roll on for a few days. Hence we show you Dosa batter recipes and also how to prepare dosa batter. We have the famous Mysore Masala Dosa which features chutney smeared dosa with a simple potato masala rolled into it. Palak Paneer dosa is a Mumbai street food along with Schezuan Chopsuey Dosa and Cheese Dosa which use dosa batter. Uttapam is a great breakfast snack to have from Onion Tomato Utttapa, Onion Uttapam to the innovative Uttpam Pizza. For Kids, make the Banana Dosa , Mexican Dosa and sweet Chocolate Cheese Dosa. Perfect Dosas are a matter of pride and this requires you know what! Perfect DOSA BATTER. Two things are important in when making dosa batter. First is the portion of rice to urad and the second is the consistency of the batter. Follow our Dosa Batter recipe whcih is foolproof and your on your way to make great dosas and recipes using dosa batter.